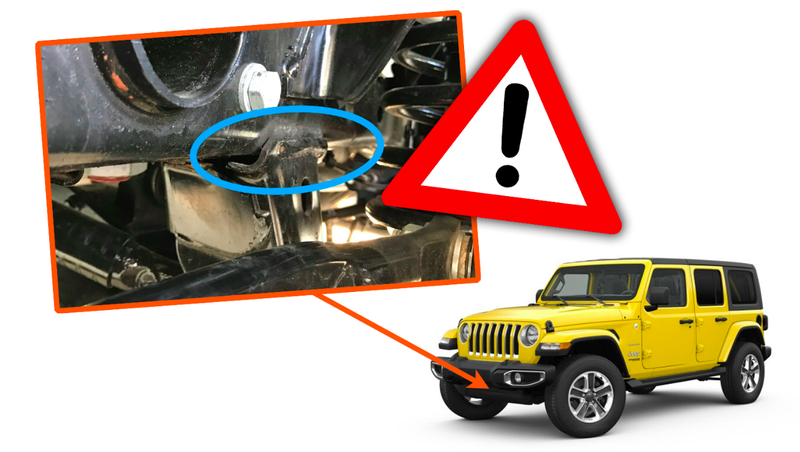 New Jeep Wrangler JL owners have been complaining about frame welds for months, and some have even experienced frame failures at a critical suspension mounting bracket. Now Fiat Chrysler is issuing a recall due to risk of a “vehicle crash without prior warning.” Here’s why this is such a big deal. Jeep will issue a recall and stop-sale on some 2018 and 2019 Jeep Wranglers because a weld meant to hold the track bar bracket to the frame might fail, “potentially resulting in the bracket separating from the frame,” and possibly causing a crash, Fiat Chrysler says in the safety recall advanced communication shown below. FCA hasn’t confirmed the legitimacy of this official-looking document posted onto the JL Wrangler Forum earlier today, though a spokesperson did confirm over the phone that “recall notices are pending” in relation to weld failures at the track bar bracket, so it’s safe to assume it’s real. FCA also said that affected cars are a “very defined population,” and that the company knows of no accidents or injuries related to the issue. This comes after numerous owners have spoken out about Wrangler JL frame weld problems. Just look at some of the images in this 24-page “JL welding Issues” thread on JL Wrangler Forums. That’s just one of many threads including pictures of what look to be rather hideous welds. It’s not just the appearance of the welds that owners have been complaining about. A number of people have had their frames actually fail, particularly at the track bar mount—the location mentioned in FCA’s recall document above. “It kind of felt like it was wanting to drift to the right even though I was putting steering input to the left,” he went on. From there, the traction control, brake, and service electronic stability control lights popped up on the dash. Once he exited the onramp and got onto the highway, Stevens says he had to keep the steering wheel at a 45 degree angle just to keep the car straight. “[I] wasn’t expecting the mount on the track bar mount to pretty much shear off,” he told me. Upon seeing this, Stevens had the Jeep towed to a dealership in Eden, North Carolina, where it now sits. “I do not trust my vehicle’s integrity,” he said, going on to tell me that he’s worried that other welds on the vehicle might also be compromised, and that that’s why he’s insisting on a vehicle buy-back from Jeep. Stevens says his JL is in the process of being replaced. Bret’s video showing the track bar failure isn’t the only of its kind, as I happened upon one while surfing a Facebook page for car technicians. Not sure yet, looks like it may have just been a bad weld from the factory. You never really know what customers do with their vehicles, so anything could have happened, but there was no other visible damage to the vehicle. Rewind to Friday night. Driving down the highway. Everything is great. I go to switch lanes, turn the wheel and to my surprise realize I’ve lost all steering control in the steering wheel. My vehicle starts to track on its own and I almost kill two other people on the road before I’m able to pull over on the shoulder. (Good thing I was in the middle lane...) I get a warning lamp of ESC (electronic stability control) malfunction. Call Jeep assist. Tow truck comes. Dealer calls me next day to tell me my track bar has been sheared off At the weld. (Says it looks like a horrible manufacturer defect). 1,100 miles and no issues until this morning when I was getting off of the Palmetto Expressway in Miami and my steering wheel went right and I kept going straight. Luckily I limped it to the closest Jeep dealer and they where shocked to say the least. Poor Track Bar Bracket welds that have broken and will cause complete loss of steering. Porous welds exceeding safety standards that could lead to catastrophic failure. Slag on nearly every weld on the frame which paint will not adhere to. This will eventually cause rusting of the frame at the welds leading to potential catastrophic failure. “Missing and failed welds on front chassis where track bar and everything else meet,” one reads. “Welds on track bar mount not lined up correctly. Throughout the rest of the frame, lots of slag, misaligned welds, bad penetration, malformed weld caps, spatter, and porosity,” another complaint says. Then here’s one from someone in California appearing to claim that their Jeep’s track bar failed in a similar fashion to Bret’s JL, Ross’s JL, Jason’s JL, and the JL filmed by the Charlotte, North Carolina dealership technician. (It’s worth mentioning that in May, FCA issued a recall related to an intermediate steering shaft issue that could cause issues like the ones described above). These track bar failures—and this recall in general—is a big deal because track bars are critical suspension components. The 2018 Jeep Wrangler’s coil sprung solid front axle suspension consists of five major links: four control arms running fore-aft between the frame and the front axle, and a track bar running laterally from the frame to the axle. The four control arms locate the axle in the fore-aft direction, but it is solely the track bar that is charged with keeping the axle centered laterally, and for taking up the side-loads on the axle. In other words, a failure of this part means there’s no structural component keeping the axle in its correct lateral position, which is why, in Bret’s video, turning the steering wheel moves the whole axle back and forth instead of effectively turning the front wheels. FCA says it’s working to get us more information on this issue (like total number of vehicles effected). We’ll update this story as we learn more. This post has been updated with additional information about the recall from FCA.